To have a place, to live and belong in a place, to live from a place without destroying it, we must imagine it. The worlds of place and imagination came together last weekend at EcoCultures, Glasgow’s festival of environmental research, policy and practice. With over 40 presentations covering topics as diverse as land reform, poetry, sculpture and urban ecology, the festival provided numerous opportunities to learn how artists, scientists and community activists are responding in very different ways to their environments. Blair Cunningham’s presentation also highlighted the value of places for collective sharing. 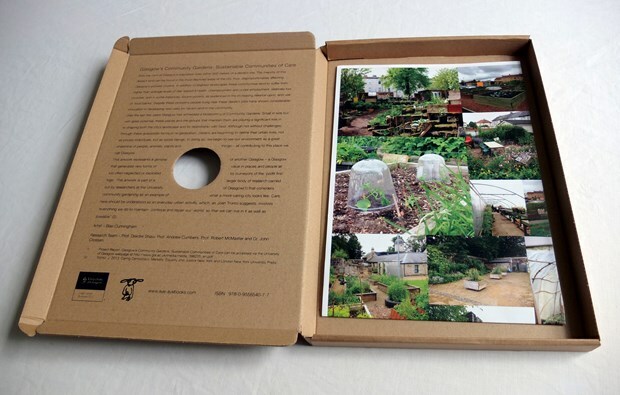 As part of a larger body of research looking at Glasgow’s growing network of community gardens, Blair was commissioned to create an artist book to explore some of the issues raised by the research, such as community empowerment and social inclusion. He described the process of identifying these community gardens, some of which are hidden from view, but still very-well used by their communities. As well as providing spaces for growing plants, fruit and vegetables, community gardens are also meeting places, with many offering learning opportunities, such as cookery classes. However, they are also engaged in a battle to survive. While some are dependent on grant funding, others rely on the good will of landowners, which may be withdrawn if the land can be sold for property development. Even so, the numbers of community gardens in Glasgow continue to grow. Growth of a different kind was under discussion at the environmental policy session. Luke Devlin, from the Centre for Human Ecology, noted that the consumerist way of life had emerged as a significant measure of growth, and that very little policy was challenging that narrative. Growth, at any cost, he argued, means people and natural resources have become expendable. With 2015 likely to be the hottest on record for the planet, Luke held out little optimism for the outcome of the UN climate change talks next month in Paris. However, Patrick Harvie MSP, from the Scottish Green Party offered some signs of hope. When the Green Party was established in 1973, he observed, recycling was regarded as something of an oddball activity. But now, he said, recycling is seen as imperative for households, companies and local authorities. Every political party in the Scottish Parliament supports climate change targets, and MSPs are held to account for their environmental policies. Another measure of progress, he suggested, was the recent speech given by Mark Carney, Governor of the Bank of England, warning bankers and insurers on the risks of climate change, something unthinkable a decade ago. Throughout the day, artists provided evidence of creative responses to environmental change. Rob St John showed a film about the “Concrete Antenna”, a sound installation at Newhaven, near Edinburgh. The antenna evokes the site’s various histories as a blacksmith, a railway siding and now a thriving creative workshop beside a wildlife-rich cycle route. Later, Marlene Creates explained the development of her Boreal Poetry Garden in six acres of forest outside St John’s, Newfoundland. During the summer months, Marlene leads visitors on a walk through the garden, pausing to read site-specific poems. Sometimes, special guests, such as geologists or musicians will add further dimensions to the walk. The garden is Marlene’s way of raising awareness about the threat to the Boreal forest, which covers a vast area across Canada, Russia, Scandinavia and a small part of Scotland. As Marlene observed, its immensity is no guarantee of its protection from climate change and deforestation. Even in her own neighbourhood, she reported, parts of the forest are being converted to lawns. Like many of the contributions to the EcoCultures event, Marlene’s poetry garden served as a reminder that individuals and communities are finding ever-more creative ways to describe, protect and live with their ever-changing environment. 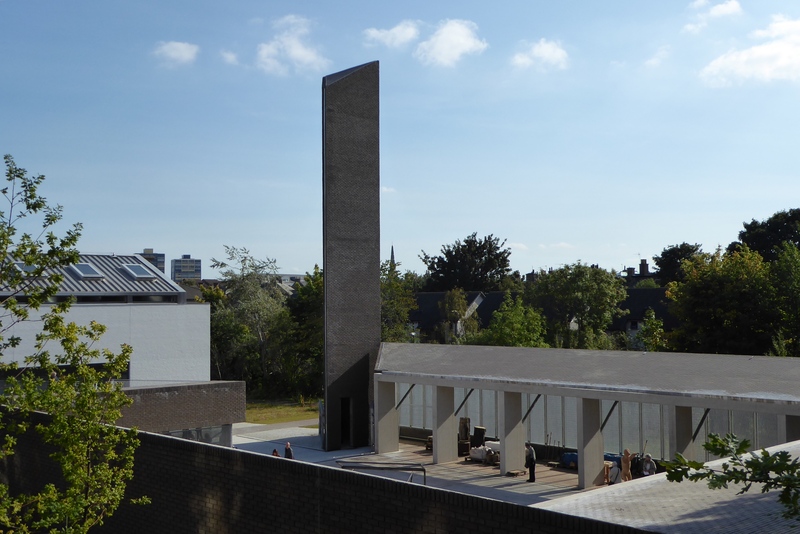 This entry was posted in Arts, culture and leisure, Environment and tagged #EnviroHum, arts, climate change, community gardens, community growing, EcoCultures, environment, environmental humanities, environmental policy, glasgow. Bookmark the permalink. ← Careers guidance: ready for the future?